Through the lenses of protest, power, and pride, We Are Everywhere is an essential and empowering introduction to the history of the fight for queer liberation. Combining exhaustively researched narrative with meticulously curated photographs, the book traces queer activism from its roots in late-nineteenth-century Europe--long before the pivotal Stonewall Riots of 1969--to the gender warriors leading the charge today. Featuring more than 300 images from more than seventy photographers and twenty archives, this inclusive and intersectional book enables us to truly see queer history unlike anything before, with glimpses of activism in the decades preceding and following Stonewall, family life, marches, protests, celebrations, mourning, and Pride. By challenging many of the assumptions that dominate mainstream LGBTQ+ history, We Are Everywhere shows readers how they can--and must--honor the queer past in order to shape our liberated future. 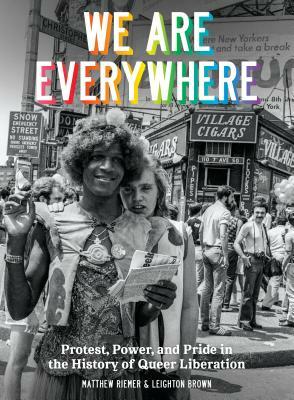 "If you think the fight for justice and equality only began in the streets outside Stonewall, with brave patrons of a bar fighting back, you need to read We Are Everywhere right now. Our history hasn’t been taught in schools; it’s been passed from person to person, whispered through the ages, often in the dark of night between lovers. But whisper no more. Here we are, in these pages—our pride and power, our blood and tears, our love and laughter. This is our fight, our history, and we must learn it, embrace it, and never, ever, forget all those who fought and died so that we may live." "At a time when repression is once again on the rise against queer and trans people in the United States, this important book shows in words and pictures the proud legacy of resistance these communities have to draw upon, as we continue to fight today, and into the future, for freedom and justice for all." "A beautiful, crucial, and engaging celebration of the queer community and our history. We Are Everywhere has something for everyone, and shows queer people of all backgrounds that they have a history, a family, and a legacy to take pride in." "More than a history book and more than a collection of photographs, We Are Everywhere is a chance to experience the queer past in all its complicated shades. Pushing beyond one-dimensional stories of gays and lesbians who are ‘just like everybody else,’ Riemer and Brown show us the radicals, the bisexuals, the gender warriors, the women, the people of color, and the militants who have always led the fight for liberation. Today, as the consequences of forgetting the oppressive past become clearer by the minute, We Are Everywhere is both an amazing look at where we’ve been and an important reminder of where we need to go." "Most of us grow up with no images showing the everyday lives and diversity of LGBTQ people. Photos and representation of the vital, powerful LGBTQ movement for equality and liberation are even rarer. This unique and essential book shares images of queer activist protest, lives, and power. It shows the joy, anger, resilience, and impact of a movement that is still making history." "I love the history geeks among us. Their work takes stamina. As a queer documentary photographer, I feel completely supported by their commitment to preserving our stories, and if Riemer and Brown’s book proves anything throughout its deeply poignant pages, it's that we all truly need each other." "We Are Everywhere is a profound education for both the baby gay and queer rights veteran and, I daresay, the straights who want to do better. In charting queer history, Riemer and Brown offer a riveting account of the central question that has troubled our movement since its earliest days: whether to bow to acceptability politics or embrace a sense of radical difference. What emerges in these pages is a fabulous queerness that refuses to stay quiet in the corner, one that will not look the other way when the most vulnerable among us is threatened. This book is an essential rewriting of queer history according to our own terms." "A revelation of accessibility and inclusion; a love letter to the Queer revolution our ancestors deserve." "As a filmmaker, fan, and forever student of LGBTQ+ history, I couldn’t be more thrilled about Leighton Brown and Matthew Riemer’s We Are Everywhere, a topical, timely, and timeless resource. In the book’s intersectional showcasing of the under-recognized and the unforgettable, the roots of our activism, anger, and community are more important and profound than ever. From the Mattachine Society to ACT UP, S.T.A.R. House to the Transgender Menace, queer history comes alive in the pages of this tremendous collection." "With our history comes a sense of family, and a fortitude that springs from sure knowledge that we are indeed a people—a people who have battled discrimination in more turbulent times so that we might enjoy greater freedom today, and a people who will continue to fight so that future generations will know full freedom. We Are Everywhere is an invaluable brick in the foundation of our collective LGBTQ+ history, and a vivid reminder that queer people have a joyful, complicated, and inspiring history. If this book had existed when I was a child, I would have grown up feeling less alone and more inspired, hopeful, and ready to take on the world knowing I stood on solid ground paved by courageous and colorful foremothers and forefathers. I am so grateful this book exists today." "Drawing from their vast Instagram encyclopedia of essential queer ephemera, @lgbt_history, Matthew Riemer and Leighton Brown restore their digital trove to its original state, the object warmth of paper. Open this book to any page and there will be something you’ve never seen, something you’ve never heard of, or something to fill you with ideas." "Matthew Riemer and Leighton Brown’s visually stunning account of the Queer Liberation Movement is populated by the fierce and brave dykes and fags, militants, sluts, pinkos, gender benders, and regular queer folk who have made history fighting for love, life, and liberation. Attuned to the victories, sorrows, conflicts, and complexities of queer movements, this book deflates historical amnesia and brings the obscure to light." "These stunning photographs—many never before published—convey the fierce diversity, defiance, sorrow, and joy of queer life across the twentieth century. Along with the lively tour of the last century of LGBTQ politics in the accompanying text, they will change the way you see the queer past." "Turning these pages and finding the faces of old friends—at the barricades, in the streets, confronting the powerful, calling for attention to be paid to stricken bodies—is an experience I will never forget. Now our historical journey has been fleshed out, showing the joy of collective action, the living texture of our determined struggle for our right to be, in the fullness of our differences. Beware liberations that create new exiles. Matthew Riemer and Leighton Brown have created a provoking text we need now more than ever, allowing each reader to evaluate the strategies of our past encounters with a bigoted State and with our own, sometimes limited, visions of what was needed. Whether you know little of queer history, or were a part of our tumultuous past, every page will hold you. Once again we are called to the streets, this time to take on Trump’s America. We Are Everywhere is a handbook for action, cherishing those who risked so much, and is a living bridge between our communities of the past and present. This seventy-eight-year-old fem is so grateful to be able to turn its pages, in constant conversation with the images and interpretations. This is history that reaches into the now with a visual richness that makes memory a living body."